Relationships are the positive connections between students, adults and peers in the school setting that foster positive social interaction and establish a nurturing environment of trust and support. Students who feel connected to school are more likely to succeed-- they have better school attendance, grades, and test scores and stay in school longer. Building these relationships require perspectives that embrace positive attitudes and beliefs, cultural and linguistic competence, an understanding of the needs and experiences of students, and an understanding of the school environment. Students who feels connected to school are less likely to engage in risky behavior. Students who feel connected to school are less likely to smoke cigarettes, drink alcohol, become involved in violence and other dangerous activities. These students are also less likely to experience emotional problems. Building positive relationships that foster a safe supportive learning environment and student connection is the responsibility of all who touch a school. Second only to family, school is the most important stabilizing force in the lives of young people. The school environment provides a natural setting to foster positive relationships among student, adults and peers. Building positive relationships within the school environment involves certified staff, classified staff, students, community, and family members. Caring adults play an important role in building strong relationships with students which facilitate their connection to school. The relationships formed between students and school staff members are at the heart of school connectedness. Students who perceive their teachers and school administrators as creating a caring, well-structured learning environment in which expectations are high, clear and fair are more likely to be connected to school. (Blum, Robert, School Connectedness: Improving the Lives of Students, Johns Hopkins Bloomberg School of Public Health, Baltimore Maryland, 2005). Blum, R. (2005). School Connectedness: Improving the Lives of Students. Johns Hopkins Bloomberg School of Public Health: Baltimore, Maryland. Includes two modules trainers can use to address bullying on school buses. Specifically, it is designed to assist school bus drivers in cultivating meaningful relationships with students while creating a positive climate on the bus. Presents six evidence-based strategies that could be implemented to increase students’ sense of connectedness to school, along with specific actions that can be taken to implement each of the strategies. 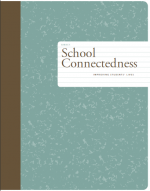 Defines and describes the components of school connectedness and identifies specific actions that schools can take to increase school connectedness. 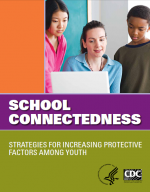 School and family connectedness are key protective factors against emotional distress, disordered eating, and suicidal ideation and attempts.